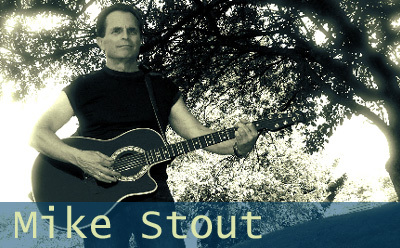 Mike Stout is a socially conscious singer song-writer and community leader. He leads crusades against local and global economic injustice, rallying people with his music to take action. His sound and lyrics are influenced by his musical heroes Woody Guthrie, Pete Seeger, Bob Dylan, Bruce Springsteen, Neil Young, Jackson Browne and Bruce Cockburn. John Hayes of the Pittsburgh Post Gazette wrote of Mike 'In the Woody Guthrie tradition, his songs reflect contemporary issues without resorting to journalism. They're more like partisan op-ed columns that grab political opponents by the throat and don't let go.' Mike tells his stories from the heart about people who are affected by unemployment, social injustice, environmental hazard, or war. Scott Mervis, music critic of the Pittsburgh Gazette, wrote “There are a lot of guys out there who pass themselves off as blue-collar rockers, but Mike Stout is unquestionably the real thing”. Mike was a blue collar steel worker and a union leader. Born in Kentucky, Mike Stout made his way to New York City and began his musical career in 1968 playing his original protest songs at Café Wa, the Bitter End, and the Gaslight. In search of a steady living he moved to Pittsburgh in 1977 to become a steelworker at the late great Homestead Works. Elected the union’s head grievance man, he used his guitar, voice, music, and lyrics to rally his co-workers at union meetings. As Grievance Chairman, he fought to win more than $10 million in lost wages, severance pay, pensions, and unemployment benefits for 3,000 displaced workers. In the 1980’s the steel mills of the Mon Valley were closed. With thousands of families losing unemployment benefits and facing foreclosure, Mike helped to organize a benefit concert at the Stanley Theater to aid the unemployed. The concert drew attention from CBS, NBC, the AP, UPI and the international press. Foreclosures were slowed and benefits and job training were extended. The funds raised by the concert were donated to the newly formed Homestead Local 1397 Food-bank, which later morphed in to the Greater Pgh. Community Foodbank, which has been feeding the needy and unemployed for more than 25 years. Mike also became a board member of Just Harvest and founding board member of the Steel Valley Authority, organizations that aid displaced workers and the poor. After the great Homestead Steelworks closed its doors in 1987, Mike opened Steel Valley Printers as an employee-owned shop in downtown Homestead. During his after-work hours, Mike started writing songs again and began his recording career. Working with producers such as former Triple X guitarist Fred Nelson, Mike has released twelve CDs. A host of talented performers has appeared on his recordings including Reb Beach (member of Winger and Alice Cooper), Pete Hewlett, (vocalist/guitarist for Billy Joel, Novo Combo, Joe Jackson), Kenny Blake (Cabo Frio), Fred Nelson (toured with Paul Gilbert of Mr. Big), B.E. Taylor (MCA Records), Hermie Granati (A&M), Buddy Hall, and more. His music ranges from fiddle infused Americana, Folk, Pop, and Rock. Over the course of his recording career Mike has released songs in tribute to heroes and heroines in the struggle for workers rights and social justice including Martin Delany, Rachel Corrie, Crystal Eastman, Fannie Sellins, Father Charles Owen Rice, and Captain Sean (George.) He has also written songs calling for action including “People Gonna Rise Again”, “Global Warming is Real”, and “We Need a Movement;” his slutes to the grassroots with “My Kind of People”, and “We Are the Working Class”, and “People to People”. Celebrating the places he has lived and the people in his life, Mike has written the style songs “Kentucky”, “Homestead Town”, “I’m Gonna Settle Down”, “Do it With Love” and more. Mike has performed at concert halls, clubs, picket lines, union conventions, protest rallies, and schools across the United States and Europe with his message of human solidarity and peace. A Duquesne University grad student took one of Mike CDs to the People to People book store in Germany and played them Mike’s song “People to People”. Impressed with Mike’s message, the book store stocked Mike CDs and sponsored several concert tours in Germany and Poland. Mike has performed for thousands at Berlin’s Brandenburg Gate and the Whitsun Youth Festival. He has sold thousands of CDs in Germany. With each new recording and every performance Mike sings his message of human solidarity to overcome the injustices in this world.